March 2017 - Steven Blogs! As some of you might now, InfoSecurity has come and gone this week. My father was at the event doing his thing, and he brought me some stuff. 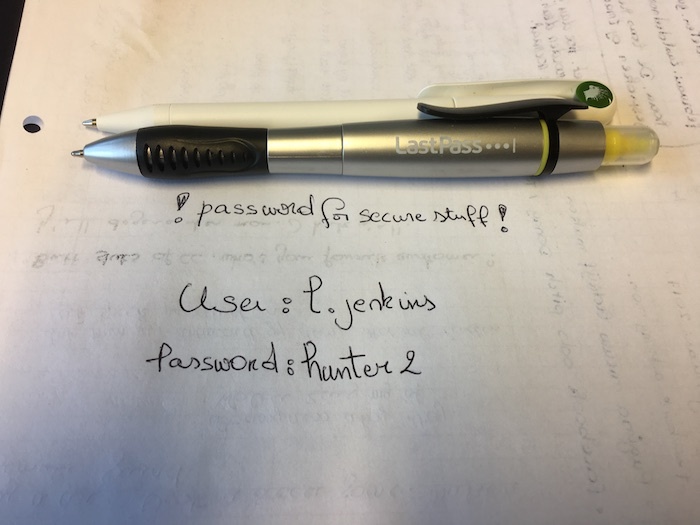 I’m a pen and notebooks guy so I got some of that, but I also a new device from the people of LastPass. LastPass is a password manager, which allows you to… well, manage passwords. Most of it based around storing your encrypted passwords in the cloud and decrypting them on your device. However, I got my hands on their latest hardware device, which can be used to store and consult passwords when you’re offline. No internet connection is required whatsoever to use this hardware device. The device is surprisingly simple and is very user-friendly. It supports all languages, has an insane battery life and is compatible with a range of other devices I used it with the PaperNote that I had in my office. The device worked right away, and I didn’t have to go through any setups. Neither did I have to pair it through bluetooth or search the web for any drivers. The device is literally ready to go. When you are holding the device in your hand, you are only a click away from starting to use it. It’s so easy to use there’s really no point in reviewing it. I’ll just let the result speak for yourself. You can see the device in action in the image below.